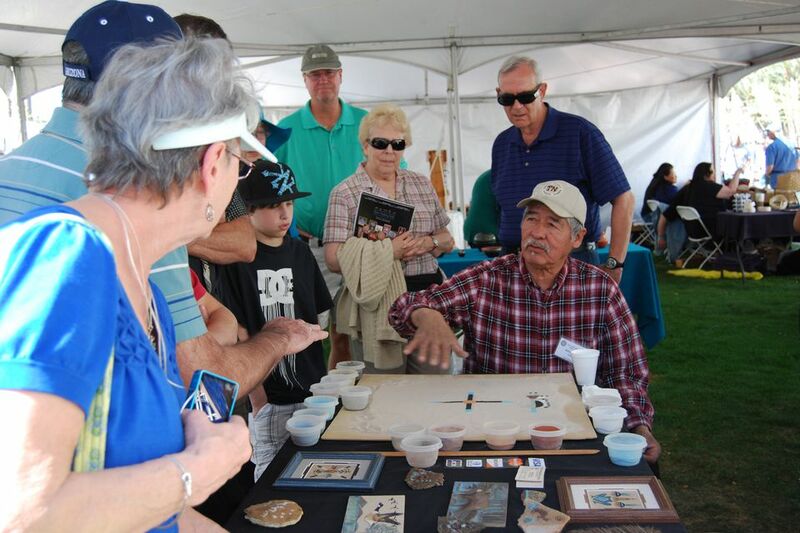 ​Each winter, Heard Museum in Phoenix showcases Native American artists at the Indian Fair & Market. Hundreds of Native Americans, from Arizona as well as other parts of the U.S., come here to show and sell their paintings, baskets, carvings, textile pieces, pottery and other works of art. About 600 artists are scheduled to participate. This is a juried art show. In addition to the art displays, there are music and dance performances, artist demonstrations, and children's storytelling and crafts, . Dates: Saturday, March 4, 2017 from 9:30 a.m. to 5 p.m.
Sunday, March 5, 2017 from 9:30 a.m. to 4 p.m.
Where: Heard Museum at 2301 N. Central Avenue in Phoenix. Here are directions and a map, including instructions for using Light Rail. How much: $20 for people ages 17+ for each day; $10 each day for students with I.D., veterans and active military with I.D. and American Indians with tribal I.D. Tickets may be purchased at the museum in advance or at the gate on both days of the show. Your ticket includes museum admission. Other discount passes that are intended for general museum admission are not accepted for this event. There are various parking lots within walking distance that will be open to the public, no charge, after 5 p.m. on Friday and all day Saturday and Sunday. Look for signage along Central Avenue, or check this map. Handicapped parking is located at the University Club on Monte Vista, just east of central Avenue. Monte Vista is one-way going east on Saturday and Sunday. There are two stages of entertainment by both established and emerging American Indian performers. Here is that schedule. These hotels in Downtown Phoenix are south of the museum, and make it convenient to use METRO Light rail to avoid the traffic and parking issues. Several hotels north of the museum are very close by. The Heard Museum Indian Fair & Market is a very well attended event. Before you head out to see all the fantastic artistic items displayed and for sale at the Market, there are some things you should know to make the experience more pleasant. See images from a previous Heard Museum Indian Fair & Market. This is a rain-or-shine event. You don't really know what the weather will be like in early March — it could be raining, cold or hot! Dress appropriately. Some exhibits are in large covered tents. Those are crowded places on days that are warmer. There is a lot of ground to cover here, so wear comfortable walking shoes. Because there are hundreds of booths at this Fair, make sure you cross over into what is usually the Heard's parking lot. There will be more booths there! There is no parking for this event at the Heard's parking lot. See the item #4 above! There is free parking in lots around the area, but you might have to walk a few blocks. There are many restrictions on residential streets here, so if you don't want your car towed, be aware of signage on those streets. There is only one entrance, on Central Avenue, where all the guests will walk in. If you are walking across Central, make sure you do that at marked crosswalks; it is illegal and dangerous to walk across light rail tracks other than in a crosswalk. There will be catered food available as well as entertainment. Not only does your admission allow you to browse this wonderful festival, but you may also see the exhibits inside Heard Museum. The Heard Museum gift shop is one of my favorite places to buy unique Arizona-themed gifts. You won't find mass-produced or non-authentic Native American pieces here. Don't be afraid to chat with the artists.